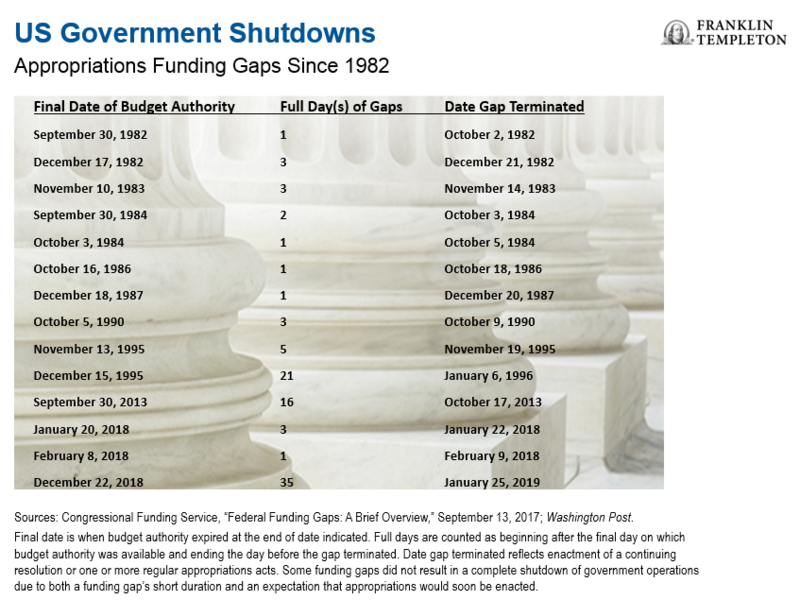 The US government’s most recent shutdown ended after 35 days, but was still longer than any previous shutdown in history. We know the reasons why it occurred—President Donald Trump wants US$5.7 billion in funds for a US-Mexico border wall, but Congressional Democrats are loath to grant that sum for this purpose. While the government has been reopened and furloughed workers will receive back pay, the border issue remains at an impasse. This time around, the shutdown seemed to be managed in a way that minimised the overall impact. One example of the containment is the Internal Revenue Service (IRS). A large part of the IRS was closed in 2013, but this time, Congress had directed the payment of tax refunds through a permanent appropriation. In addition, national parks remained open during the shutdown, whereas they were closed during the 2013 shutdown. Over the long term, these data disconnects should reconcile, but near term, we could see more uncertainty about where the US economy stands until a firm spending deal is reached. The markets don’t typically respond favourably to uncertainty. That being the case, we could see heightened market volatility. The shutdown has impacted general consumer confidence as well. One confidence survey, the Univeristy of Michigan Consumer Sentiment index, dipped to 90.7 in the January (preliminary reading) from 98.3 in December. That said, US economic fundamentals remain strong, so we don’t anticipate a US recession this year. However, another shutdown increases the risk and probability of a near-term recession. A prolonged shutdown could also increase costs for companies dealing with the impacts which could lower their corporate earnings, particularly for small businesses who depend on government financing or government workers who consume their goods and services. The Chairman of the Council of Economic Advisers Kevin Hassett has stated first-quarter growth could amount to zero if the stalemate were to continue.